The stitchers learn how to make a baby quilt by crocheting granny squares. 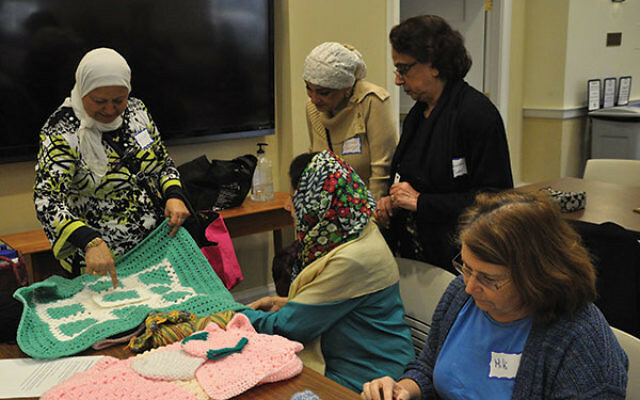 On a recent Sunday, about 40 Hindu, Muslim, Jewish, and Christian women spent two hours together in Princeton carefully weaving prayer, yarn, shared stories, and expertise. Gathered on Nov. 13 at Nassau Presbyterian Church, they were taking part in the second meeting of Central New Jersey Interfaith Stitchers for Peace; the first was held at the Islamic Society of Central Jersey in Monmouth Junction, and the third will be at The Jewish Center in Princeton, on Sunday, Dec. 11, 2-4 p.m.
Nassau Presbyterian Church member Barbara Happer of Princeton came because she explicitly wanted to be part of an interfaith group. “I think it is important to get to know my neighbors and have friends from other faith communities,” she said. Aruna Bhargava, Boyd’s neighbor and a member of Arsha Bodha Center, a Hindu institution in Somerset, was drawn to a diversity that reminded her of her home in India, where she lived among people from many different religions and communities. 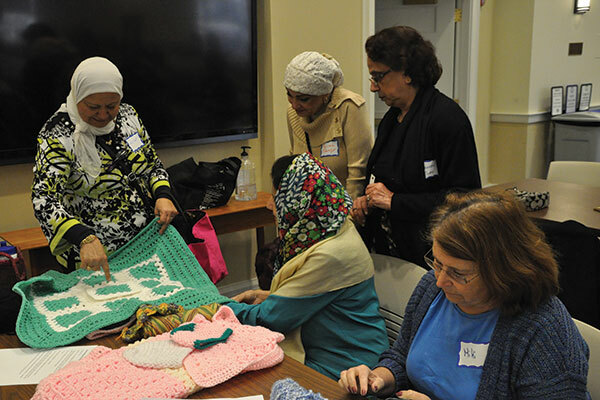 Nassau Presbyterian Church member Jenny Mischner of Princeton said that the anxiety surrounding the presidential election motivated her to try something different and out of her comfort zone, and headed to the first Stitchers meeting at the mosque.